National carriers in countries of the former Yugoslavia are struggling to survive in the current economic environment as operating costs rise and they face competition from large network carriers and expanding low-cost carriers. The former Yugoslavian nations of Bosnia and Herzegovina, Croatia, Montenegro, Serbia and Slovenia all have national airlines but are struggling to become profitable, while the national carriers of Kosovo and Macedonia have already failed and have not been revived. The main airlines in the region are Bosnia and Herzegovina’s B&H Airlines, Croatia’s Croatia Airlines, Montenegro’s Montenegro Airlines, Serbia’s Jat Airways and Slovenia’s Adria Airways. Adria Airways, which is currently undergoing a privatisation attempt, supports the view that a merger involving all the players in the region could become necessary. CEO Klemen Boštjančič told Slovenian media outlet SiOL that “if the sale of Adria to a foreign partner fails, then our last chance is for regional integration with Croatia Airlines, Jat Airways and Montenegro Airlines”. 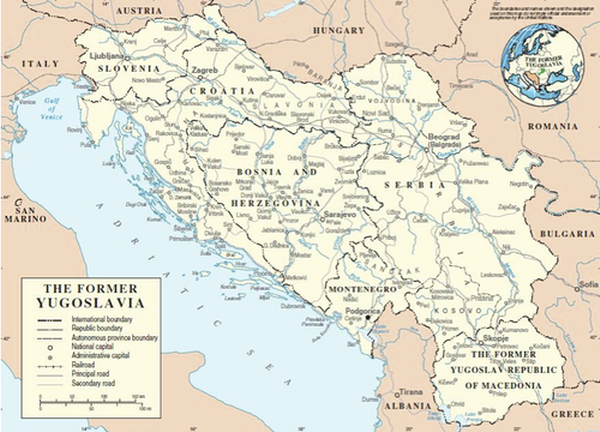 While Slovenia is in the European Union, Croatia, Serbia and Montenegro are currently outside the EU. Croatia is to become a full member of the EU from 01-Jul-2013 while Serbia and Montenegro are deemed recognised candidates. Merging airlines between EU states and non-EU states may present political difficulties. The creation of a single airline for the nations would also result in a loss of identity somewhat as there would no longer be a true national carrier for each country. However, in 2010 the national railways of Croatia, Serbia and Slovenia formed a joint operation in order to increase revenues and improve services. While Macedonia and Montenegro did not join, they cooperate with the other three nations’ railways. The railway example shows such an idea of companies across some former Yugoslavian countries merging or cooperating can work. But the merger of an airline would bring other difficulties. The formation of a single airline would require a main hub from which the airline’s operations are based. This is different to the railway merger as each country still operates their railway through their own country as previously. One could assume the largest carrier would have most of the bargaining power in a potential merger. This could mean Croatia Airlines, if it is part of the merger, could have the muscle to direct the base of the merged operation to Croatia. While Croatia’s capital, Zagreb, is not the central point in the former Yugoslavia, its airport infrastructure is presumably more able to handle a larger operation than the bases of the other involved airlines, considering Croatia Airlines is currently the largest airline in the region. Note: The Republic Kosovo is a self-declared independent state and is recognised as an independent state by 91 states. All the carriers in the region have relatively small operations. Following Croatia Airlines, based on current capacity (seats per week) are Jat Airways, Adria Airways, Montenegro Airlines and B&H Airlines. Croatia Airlines is the only carrier which has a domestic network; the rest rely solely upon international services. This supports the idea of a merged operation to be based in Croatia as there is a domestic market to provide feed as well as extensive international operation. Kosovo’s Kosova Airlines ceased operations in May-2006 when its only aircraft was returned. The company is still operating but more as a travel agency, offering services on airlines such as airberlin and Germanwings who operate into Kosovo’s capital Pristina. Macedonia’s MAT Macedonian Airlines ceased operations in Sep-2009 after 15 years of operating as the Macedonian national carrier. Following MAT’s shutdown, MAT Airways was established and commenced operations in 2010 as a charter carrier. It is currently owned by Dutch carrier Bays Air. In 2011 the merger idea was proposed during discussions between the Serbian Government and Turkish Airlines. At the time, the Serbian Gvernment suggested a regional airline, Balkan Airways, could be established as the national carrier for Serbia, Bosnia and Herzegovina, Montenegro and Macedonia. The Croatia and Slovenian carriers have also been involved in cooperation. In Sep-2011 Croatia Airlines and Adria Airways reached an agreement on a common business plan model under which the airlines agreed to strengthen their ties and cooperate on aircraft leasing. This was designed to allow the carriers to improve efficiency and fleet utilisation. Both carriers are part of the Star Alliance. Adria Airways is looking to privatise in 2012 and is currently seeking strategic investors. The airline said its last chance for survival if the privatisation attempt fails is regional integration with the other national carriers in the region. Adria Airways already cooperates with Jat Airways and Montenegro Airlines through codeshare agreements. Adria Airways CEO, Klemen Boštjančič, stated while the airlines do enjoy cooperation, such regional integration could fail due to political reasons rather than the commercial aspect of a merged operation. Adria is currently 70% government owned following Slovenia’s sale of 30% of the carrier in Sep-2011 to a group of four banks as part of a debt for equity swap. The banks are considered short-term investors and are expected sell their stakes as soon as an airline investor emerges. Mr Boštjančič told CAPA in Dec-2011 the airline will start the search for a strategic partner in 2012 with the goal of completing a sale by the end of 2013. B&H Airlines is currently majority owned by the Government of Bosnia and Herzegovina, however, 49% is owned by Turkish Airlines, which also has management control of the carrier. In Mar-2012 Turkish Airlines chairman Hamdi Topcu said the airline is yet to execute its plans for B&H Airlines as the Government has failed to provide the necessary responses. Croatia Airlines is aiming to break even in 2012 followed by a return to profitability in 2013 as it embarks on a new fleet plan and expansion of its Eastern European network. The airline is wholly owned by the Croatian Government and has not stated it is looking to privatise. Serbia’s Government is in discussions with a group of three Serbian businessmen to sell a 50% stake of the carrier in return for a EUR25 million investment. The Government will keep the remaining 50% share and will invest EUR25 million into the carrier once the sale has been completed. The Government of Montenegro stated it plans to privatise Montenegro Airlines at some point in 2012 by way of a public tender, following restructuring. The carrier previously attempted privatisation in Sep-2011 when it commenced a tender process. El Al Israel Airlines, Etihad Airways and Arkia Israel Airlines purchased the tender documents, but none made an offer. Turkish Airlines was reportedly also interested in acquiring the carrier. Montenegro Airlines CEO Zoran Djurisic is opposed to the privatisation plans, stating in Oct-2011 he believes privatisation would have a long-term negative impact on the airline and the country. A flag carrier for a region is not a new idea. SAS Scandinavian Airlines was formed in Aug-1946 as a combination of a Swedish carrier and the flag carriers of Denmark and Norway. Following Sweden’s flag carrier joining the consortium in 1948, the group became SAS Scandinavian Airlines. The airline has three hubs, one in each country’s capitals, with Stockholm Arlanda being the main base for the airline. The Group is currently jointly owned by the governments of Sweden, Denmark and Norway though there is speculation the governments are interested in selling some of their stakes. SAS also has subsidiaries Widerøe and Blue1. Widerøe operates mainly domestically in Norway while Blue1 is based in Finland, feeding traffic from Finland to SAS’ main hubs. While not currently profitable, SAS has shown a cross-country merger can work. Latin America’s TACA is another example of an airline that has involved the cooperation of multiple carriers from different countries. TACA is an airline consortium and brand comprising a group of five airlines in Central America. The TACA Group includes TACA (El Salvador), Aeroperlas (Panama), Aviateca (Guatemala), Sansa (Costa Rica), La Costeña (Nicaragua) and Islena Airlines (Honduras). The group later established a subsidiary in Peru (TACA Perú) and merged with Colombia’s Avianca. TACA and Avianca continue to operate as separate companies. In the current environment, there are many carriers seeking strategic investors, not just in the former Yugoslavia but elsewhere in Eastern Europe with carriers such as LOT Polish Airlines, CSA Czech Airlines and airBaltic all seeking investors. With many to choose from, potential investors can afford to take more time to consider opportunities; time some of these carriers often do not have. Being national carriers, investors are likely to encounter issues with the governments of the airlines as they remain an important part of national identity. Issues such as these have been seen with Turkish Airlines’ frustrations with Bosnia and Herzegovina over B&H Airlines. As the carriers become more desperate, their governments may relax some restrictions or conditions of a sale in order to convince investors to sign on. The final option if privatisation fails is for regional consolidation between the airlines of the former Yugoslavia, which may improve their ability to attract investment for privatisation. However a regional merger, whether under government or private ownership, would be at the expense of national identity. Such mergers create opportunities and challenges at the same time. While new economies of scale are created, inevitably it is a challenging and politically sensitive exercise when it comes time to determine a new network and decide which hubs need to be downsized.